I just finished writing a review of The Strokes' criminally over hyped 2001 release, Is This It?. I didn't like it much. Actually, I didn't like it at all. It is the sort of release that highlights and emphasizes one of the music industry's most notable faults: that band clearly networked in the proper circles. They made connections with the right A&R guys, played the right venues, struck the poses at the correct marks, were properly rock-star rowdy at the right parties while managing the proper submissiveness when it came to sign their lives away into the heart of the machine. These aspects of their collective being were apparently more than enough to gloss over their collective lackings. Things like their lack of talent, for instance. Or the complete lack of energy, creativity, or any kind of pathos on their album. Their willingness to sign on the line, to play the right parts, to be a Product first and a Band later was more than enough to get a major label, or more importantly the Major's Marketing Department, behind them. The rest was easy: just step off the bus at the right time and play for the MTV video shoot. 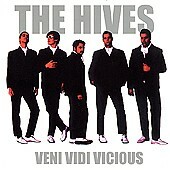 The Hives are the anti-Strokes in my world these days. They're a punk rock band, first and foremost. I like punk rock bands. At least the ones that play punk rock. Punk is a funny genre, in that 30 years later we're all still fighting over what it exactly means to be punk. I go on gestalt, myself. I look for music that is stripped down, energetic and feels alive. I know that's a vague sort of thing to say, but that's the gist of what punk is in my world. A leftist attitude and "damn the Man" outlook certainly helps as well. The Hives play the music that The Strokes should have to play in order to get the hype and popularity their label has bought for them. Energy packets wrapped up into three-minute sonic assaults, The Hives music is a therapy session conducted through digital optics. That's not to say they're something massive or world changing. They're just a rock-n-roll band, after all. But they're a rock-n-roll band that manages to encapsulate something meaningful about what "rock-n-roll" should actually mean. And that counts for something. Veni Vidi Vicious is a CD they released in 2000. It starts off with a track called Declare Guerre Nucleaire, one minute and a half of nuclear fusion in its own right, leading into the full-scale rock action of Die, All Right and A Get Together to Tear It Apart. Garage rock riffs, simple structures, and driving but not overpowering rhythms tear the listener down as the disc continues through Main Offender, climaxing with the anthemic Hate to Say I Told You So as the album's fulcrum. The second half maintains the vibe, plateauing out with Introduce the Metric System In Time and holding through the final tracks. It's not necessarily a great album, but it is certainly a very good album, if a mostly unknown one. The fact that it has been ignored since 2000 while Is This It? gets the full-on hype treatment (and the attendant fawning over by many in the "indie" press) just furthers my growing disdain for, well, most everything. The Hives are releasing a "Best of…" CD later this year (April, to be precise), called Your New Favorite Band: Best Of. Check it out. WRAS (88.5 in Atlanta) is doing their part by playing up Veni Vidi Vicious beforehand, which reestablishes some vague confidence in the species for me. I'm not sure exactly what songs are going to be on the compilation of course, but the entire catalogue is pretty raucous, so it can't be bad. Take the chance on it, especially if you like the new (return of the old) style of bands like The White Stripes. The Hives rock more than The White Stripes and they have more 60s garage punk in them than 70s Zeppelin bombast, but still manage melody and "that feel." If you can, sell your copy of Is This It? to a used CD shop in order to get the money to buy The Hives' disc. That would be bloody well great.